Whisky: Technology, Production and Marketing explains in technical terms the science and technology of producing whisky, combined with information from industry experts on successfully marketing the product. 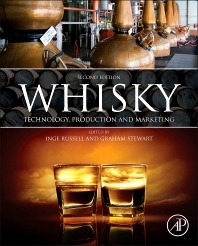 World experts in Scotch whisky provide detailed insight into whisky production, from the processing of raw materials to the fermentation, distillation, maturation, blending, production of co-products, and quality testing, as well as important information on the methodology used for packaging and marketing whisky in the twenty-first century. No other book covers the entire whisky process from raw material to delivery to market in such a comprehensive manner and with such a high level of technical detail. Foreword written by Alan Rutherford, former Chairman and Managing Director of United Malt and Grain Distillers Ltd.
Fermentation scientists, brewers and distillers; employees in many areas (technical, production, R&D, marketing) of the alcoholic beverage industry, alcohol manufacturers, students studying whisky and alcohol, and individuals with an interest in whisky who want to have an advanced understanding of the science behind whisky. What happens inside of the yeast cell under aerobic conditions? How much yeast is needed to pitch a distilling fermentation? Inge Russell is the Editor-in-Chief of the Journal of the Institute of Brewing, a Visiting Professor at Heriot-Watt University, Edinburgh, Scotland, a Professor at the Alltech Brewing and Distilling Academy and a Fellow of the Institute of Brewing. She has over 40 years of research experience in the brewing and distilling industry. She has served as President of both the American Society of Brewing Chemists (ASBC) and the Master Brewers Association of the Americas (MBAA). She holds a PhD and DSc from the University of Strathclyde in Scotland. She has authored over 150 papers in the area of yeast biotechnology and is a co-founder and co-editor of the journal “Critical Reviews in Biotechnology”. Graham G. Stewart has been Emeritus Professor in Brewing and Distilling at Heriot-Watt University, Edinburgh, Scotland since he retired in 2007. From 1994-2007 he was Professor of Brewing and Distilling and Director of the International Centre for Brewing and Distilling (ICBD), Heriot-Watt University. For 25 years prior to this he was employed by the Labatt Brewing Company in Canada, holding a number of scientific/technical positions and from 1986-1994 was its Technical Director. He holds a PhD and DSc from Bath University and is a Fellow of the Institute of Brewing. He was President of the Institute of Brewing and Distilling in 1999 and 2000. He has over 300 publications (books, patents, review papers, articles and peer reviewed papers) to his name and is a co-founder and co-editor of the journal “Critical Reviews in Biotechnology”.